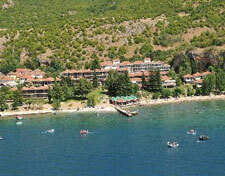 The DESARET hotel is located on the shore of Lake Ohrid, in the vicinity of Peshtani at the distance of only 12 km from Ohrid. It was built in a traditional Ohrid architecture from the 19th century, providing 580 beds in 246 comfortable twin rooms, 6 suites in the hotel and 18 suites in nine separate villas within the complex. Desaret offers two restaurants, congress hall equipped with conference and multimedia system for presentations with 700 seats, a summer terrace, private sandy beach and car park. The comlex also offers grill restaurant, night bar, disco club, as well as sport terrains for tennis, handball, soccer, table tennis in addition to table-tennis hall and bowling alley. The Desaret hotel complex widely opens the doors and welcomes everybody who would like to hold a seminar, conference or business meetings in its quiet and wonderful sourroundings. © RUSSIA TODAY TV - partners 2005-2009. All rights reserved.